Hello there, forum-goers! It is I, Falaflame, and I will bring you up to date with what has been going on. I feel like I have not been posting a whole lot of updates outside of the FEP skype chat, so I figure I'll give you guys a bullet bill so you can catch up to the pack. First off, staff issues. Now, I'm not sure if I've posted this before (I have on the skype chat, but I don't think I did here), but there has been a massive staff overhaul in the past month or so. We thank them for their large contribution to the site, and should they return to the site and show interest in being staff again, they may retain their roles. But the reasons why we've relieved them was because they were inactive. But moreso, our staff page has felt kind of bloated for quite a while. 5 admins for a community as small as ours doesn't look too good on us. So I spoke with sirocyl about it, and we felt me, sirocyl, and fensti can handle the site just fine. 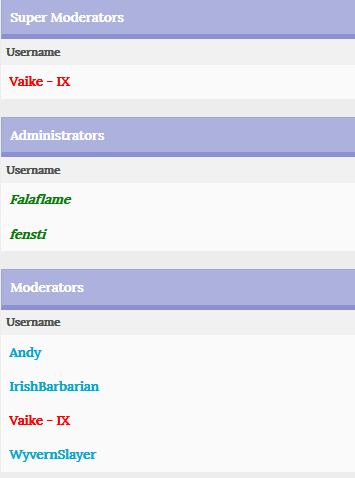 But with that move, we've also promoted Vaike - IX to Super Moderator. If you haven't given him any congratulations, please do so now. He's deserved it with his work ethic and general positive attitude. "What in tarnation is going on here!?" Well, what happened was, sirocyl has recently decided to step down for a number of reasons. One, his workstation may or may not be forcibly taken away, and two, me and a few of his friends decided that due to the large amount of stress, it was the best of his and FEP's interest to take a long break. He will be back, however. I will be retaining his place as the 2nd in command for now, until his return. Sirocyl is currently working on handing me the reins so I can finally do FETO resets, and possibly activate accounts on FETO. And who knows, since I will be handed full power, I may start FETO tournaments again. I do have the theory of general coding locked down, but that doesn't necessarily mean I know what exactly to do around here. So the bad news is, our plans of restructuring FEP as a whole (not just FETO, but the forums, as well as the site index itself) have suffered a setback. Our plans were to pry FETO off of the IPB platform, and separate the site from the IPB as well, and have them all standalone. That way, it will be miles easier to handle each individual feature we have here. But for now, we will be putting that on the backburner. I know most of you are sick of hearing this, but it has to happen for his sake and for FEP's. More good news is coming, too! We are currently in talks with Petalburg Woods Network about possibly becoming affiliates with each other. PWN's current leader, Felly (You may have seen her around before), as well as I, have been friends for about 4 years now, dating back to the Triforce Dashers clan I used to lead. She is talking it out with the rest of the staff there, myself included. (I am also staff there as well) We're still trying to come to terms with an agreement. If an agreement is reached, not only will we benefit each other quite well, but we do share common ground, too. I will let you know what happens when a deal is confirmed. Also another thing that will soon be done, and is currently being worked on is, the profile system here will be revamped. It just looks really bland, and unused, and I just want to find some more use for it. I will be adding Visitor Messages, User Profile Customization, and YouTube Video support. That way you can communicate with other people using your profiles, too, and make it a lot more colorful. That is pretty much all there is I can share that I haven't already brought to light. Much thanks to WyvernSlayer and his crew for reviving the RPs here, as it has certainly brought more activity and general interest here. If there are any questions, please post them here and I'll help you out as much as I can. Congrats Speedy. Thanks to Siro for doing so much for us already. As far as coding goes, perhaps Nolan could help you. It was quite a while ago now, but he expressed interest in helping code feto, plus iirc he's familiar with all the web-based languages. Congrats to our new moderators. Siro our Hero... thanks for all you did for us I hope you can fix your life. I still wish that you play a Fire emblem game because they are just awesome... At least yocan remember us that way until your heroic return. (06-24-2014, 07:47 PM)Falaflame Wrote: I will be retaining his place as the 2nd in command for now, until his return. Sirocyl is currently working on handing me the reins so I can finally do FETO resets, and possibly activate accounts on FETO. And who knows, since I will be handed full power, I may start FETO tournaments again. Also, keep in mind, that while he's second in command, I'm still second in capability. I'm handing the reins to FETO and the forums over to him, as well as admin capability on IPB (which is limited because of a serious issue in the panel), however fensti and I are the only people who have full server capabilities, and I can see that being the case for a while. I will be making it so that he has full power over FETO, though. (06-24-2014, 07:47 PM)Falaflame Wrote: As well, you must have an extensive amount of knowledge in coding experience (PHP, C++, Perl, Java, SQL, and more). (06-24-2014, 07:47 PM)Falaflame Wrote: More good news is coming, too! We are currently in talks with Petalburg Woods Network about possibly becoming affiliates with each other. PWN's current leader, Felly (You may have seen her around before), as well as I, have been friends for about 4 years now, dating back to the Triforce Dashers clan I used to lead. She is talking it out with the rest of the staff there, myself included. (I am also staff there as well) We're still trying to come to terms with an agreement. If an agreement is reached, not only will we benefit each other quite well, but we do share common ground, too. I will let you know what happens when a deal is confirmed. I hope it proves to be a beneficial partnership. (06-24-2014, 07:47 PM)Falaflame Wrote: Also another thing that will soon be done, and is currently being worked on is, the profile system here will be revamped. It just looks really bland, and unused, and I just want to find some more use for it. I will be adding Visitor Messages, User Profile Customization, and YouTube Video support. That way you can communicate with other people using your profiles, too, and make it a lot more colorful. Chat has been opened. It's still beta, report any issues.